I hope you all had a great weekend. Our started off with a snowy morning on Friday. I know, a lot of you guys are probably saying, that’s snow? For us in Austin, TX, snow is kind of rare so just this bit caused quite a bit of fuss on the roadways early in the morning. Luckily it was pretty much all gone by mid-morning and I actually can’t complain as I didn’t have to be out in it anyway. It was funny though when I left home for an appointment in the afternoon I saw a house that had a snowman on the front lawn and I think it had more grass than snow but it was cute. 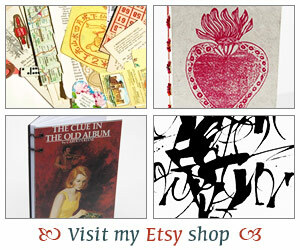 The rest of the weekend was a bit of a blur between some bookbinding and adding a few goodies to my Etsy shop. And, this Sunday I got to see one of my cousins who was passing through town. It’s always so fun to catch up with my younger cousins and see what is going on in their lives and to hear about their dreams for the future. Regarding my reading I’m still concentrating on the books I mentioned in my previous post but I do have to add a new book to the mix soon as my book group meets next week and we have the author in our midst! So that’s the scoop for what’s been going on around here. I’m still a bit behind on my blog reading but I noticed that some of you are talking about reading challenges for next year. Oh boy, you know I can’t resist those! Let me know how your weekend was and if you are planning on taking on any reading challenges next year. My daughter called from Baton Rouge to tell about the snow! She was so excited. Snow is a real anomaly in BR, Austin, and Houston, and I think it was the first real snow my grands had seen. They had enough to build two snowmen, the ground was covered, and the trees. I haven’t read much in a week–so busy with other things, including sewing. I am not planning on any challenges, but love seeing the challenges others join to get ideas for new books! Jenclair – Oh I bet the grans were so excited to see snow and play in it! I always say snow is lovely to look at but thank goodness we don’t have much of it, if ever. Are you making any special holiday dolls or other sewing projects? I’ll be excited too, Iliana. We don’t even have four seasons here so the only option is to travel if we want to see snow. Well when snow is a rare thing even a dusting is exciting! 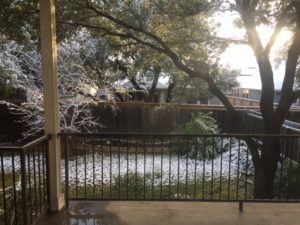 My friends in New Braunfels and San Antonio were thrilled to get some snow! Really makes it feel like Christmastime, doesn’t it? I wouldn’t mind a little dusting here on the coast, but I don’t want to see what we used to get in Nebraska ever again!